The Disney Art of Animation resort opened in the Summer of 2012 and is Disney World’s newest resort. This is one of many Disney Art of Animation Resort Reviews and I hope you find it valuable! There are four sections: Little Mermaid (with 864 rooms), Finding Nemo (with 320 suites), Cars (with 480 suites) and the Lion King (with 320 suites). What makes this resort stand out are the family suites in the Lion King, Finding Nemo and Cars sections, which sleeps six people. The Disney Art of Animation Resort tells the story of the Animation process with early artist sketches to finished images. The main building, where you check in, is called Animation Hall and has the Pixel Play Arcade, the Ink and Paint gift shop and the food court called the Landscape of Flavors. The food court is open from 6am to midnight, and has a variety of great food options. We loved the pasta bowls, the hamburger was one of the best I have had in awhile from anywhere, and the salad bar was top notch. There is also a poolside snack bar at the main pool, and pizza delivery. In typical Disney imagineering, every section’s court yard and building has you immersed in the artistry and enchantment of the Disney and Pixar animated classics. We stayed in a Art of Animation Cars Suite, and just to get to our room, we took a ‘paved road’ called ‘Route 66’, the pool had road cone-shaped cabanas, and the laundry room was housed in the ‘Cozy Cone’ Hotel. In the Lion King area, there is an elephant ‘graveyard’, and the Finding Nemo area has the Righteous Reef playground, and Splash Pad. 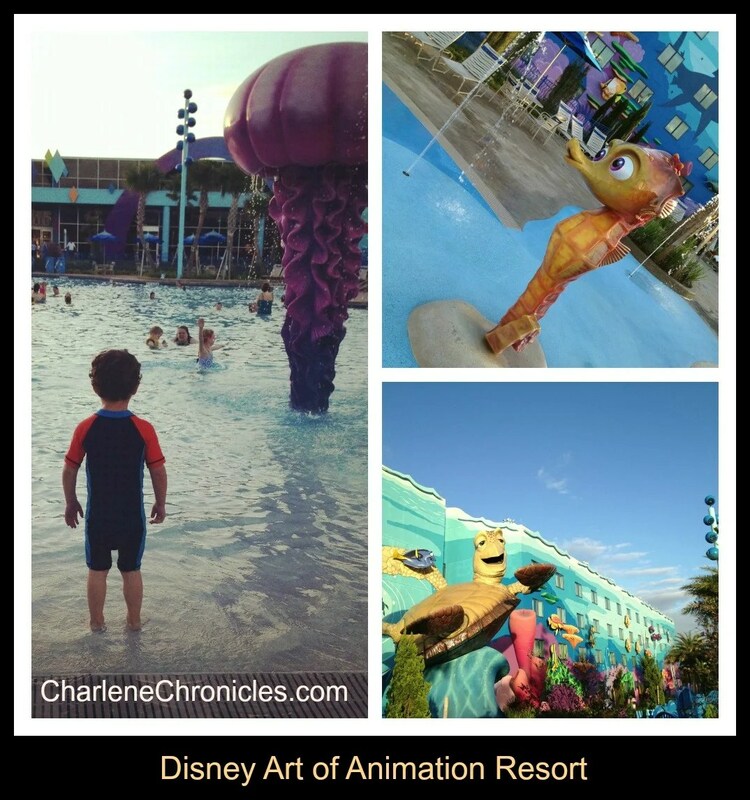 The Art of Animation resort has three pools. The main pool has underwater speakers that periodically pipe in themed music or messages from film characters. So don’t be surprised to see so many people swimming underwater. So make sure to pack the goggles and nose plugs! We traveled in December and the weather was in the upper 70s so we were able to enjoy them. The toddler splash area was a blast, but I was personally disappointed in the “playground”. It wasn’t the playground I was envisioning when I saw that the resort had a playground. It was more like a fancy slide. So maybe a more accurate description? But our son loved it. We also liked all the walking paths, and we even walked across the connecting bridge to the Pop Century Resort. Once you get to your room, the playful accents that hallmark the outdoor areas extend indoors too. The Finding Nemo suites have coral-shaped chairs and bubble ceiling lights with rusty submarine-like tiles. The Lion King suites has the various characters in art work, and a leaf shaped chair, as well as themed curtains, rugs, and furniture. The rates (as of 01/13) are around $250 for a suite and as low as $100 for the standard rooms. There is so much to see and do at the Resort if you decided to forego the parks one day. The resort has a lot of kid activities during the day and there were outdoor movies every night! With the walking paths, the decor, a game room for rainy days, the many water play options, several food options and affordable laundry facilities, we will definitely be staying here again! Have any questions about our stay, let me know in the comments and I will do my best to answer! To see my review of the Art of Animation Cars Suite, read my post here. Otherwise, here are some other Disney-related posts you might be interested in! Image Credit: My own. All Rights Reserved. Disclosure: I received a complimentary two night stay at the Art of Animation resort. All thoughts, opinions and content is my own.